Kimberly Trevino is a second-year Doctoral student in the Community Analytics program. Her current research interests include inequality and stratification, technology, and labor. She has four years of experience in project management, and has contributed numerous community initiatives. At the University of Northern Colorado, she was the lead graduate researcher at the Social Research Lab while pursuing her Masters in Applied Sociology. 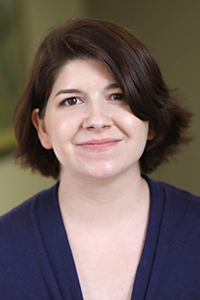 During Kimberly’s first year at the Center for Community Research and Development at Baylor, she participated in a large-scale multi-methodological data collection project for a local nonprofit. She also was the project manager for an educational marketing project in which she conducted focus groups with Waco residents. Currently, Kimberly is managing a project for the Evangelical Lutheran Church in America, as well as consulting on local level projects. Kimberly Trevino's Full Curriculum Vitae.